I have been quite sick for several days and my journal has been discontinued. I have suffered much, having had a spell of Neuralgia in my body and I am not yet quite well. We have heard since I have been sick that Corinth has been evacuated. We do not yet believe it, but fear it, the news depresses me very much, thick darkness that might be felt sometimes to have settled over my soul. I could see no merciful Father hand in the stern decree that night. I have suffered more mental anguish. It made me restless and aggravated my bodily sufferings. Oh! How brightly my dear children's images rose up before me. Every fresh disaster to us and success to our oppressors makes our separation longer, but now I have more faith, our cause looks dark, but I still have faith that the Lord will interfere in our behalf. He may see fit to destroy us and them may he give us a spirit of submission to say "Thy will be done." My husband left us again this morning, he scarcely knows for what or where, being unable to hear from Corinth. He will try to go there I expect. It made my heart ache to see him to thus, so unlike what he was once. Not knowing where to turn his footsteps. May the Lord be with him and direct him in the right path. I will determine my future course when he is settled. [General] Beauregard has ordered all the cotton to be gathered and burned in this country and the Cavalry [sic] commenced two days ago. They have not yet got here but the cotton is piled for the torch. Mr. S. sent word yesterday to Denmark [Tennessee] for any one who wanted spinning [sic] cotton to come and get it today, and many have sent. It looks awful to have to burn such beautiful cotton. The Fall was dry and it is so white and free from trash, and if it is true that England is now suffering for cotton what will it be another year, last years [sic] crop destroyed and none making. We will not suffer for it we can make bread and meat, the Lord blessing with the rain. But suppose they are willing to suffer for they will not help us. It will show the world that we are terribly in earnest, and I hope it will have good effect; but the whole world is against us. It will show that we are against us on account of our institutions, and I feel the can see no good in us. Mr. Estes returned this evening, the cars are not running and of course he could not get off. Some say that they are fighting at Corinth, but we do not know and must wait patiently until time reveals what is happening. Rather warm today. Aunt Judy Lytle came by & left cousin Mary & Johnny here to dinner, while she took me out to see Sister Amanda with her pass. I was rather uneasy for fear some union man or woman would stop Aunt Judy & say something to her and find out I was along, for they wouldn't begin to give me a pass. I had on cousin Mary's hat, two veils & was to pretend I was quite sleepy. The guards didn't say a word to me, & I got home safely after an hour or two's visit out at Uncle Tommie's. Cousin Mary is going to remain with us, & Aunt Judy & Johnny went home. That same old French Yankee came again this morning, & by Pa's permission remaining all night long. He has not been down to any of his meals, been quite unwell. I hope he will not be troubled much longer with any such. It is reported there is bad news for us, but I do not believe it. I will copy the dispatch "Near Corrinth May 30-To Gov. johnson. We are in possession of Corrinth. The enemy are retreating South. H. W. Halleck, Maj. Gen."
31st May, Sunday.--The Bishop of Georgia preached to-day to a very large congregation in the Presbyterian church. He is a most eloquent preacher; and he afterwards confirmed about twenty people--amongst others, Colonel Gale, (over forty years old,) and young Polk. After church, I called again o­n General Bragg, who talked to me a long time about the battle of Murfreesboro' (in which he commanded.) He said that he retained possession of the ground he had won for three days and a half, and o­nly retired o­n account of the exhaustion of his troops, and after carrying off over 6,000 prisoners, much cannon, and other trophies. He allowed that Rosecrans had displayed much firmness, and was "the o­nly man in the Yankee army who was not badly beaten." He showed me, o­n a plan, the exact position of the two armies, and also the field of operations of the renowned guerillas, Morgan and Forrest. Colonel Grenfell called again, and I arranged to visit the out posts with him o­n Tuesday. He spoke to me in high terms of Bragg, Polk, Hardee and Cleburne; but he described some of the others as "political" generals, and others as good fighters, but illiterate and somewhat addicted to liquor. He deplored the effects of politics upon military affairs as very injurious in the Confederate army, though not so bad as it is in the Northern. At 2 P. M. I traveled in the cars to Wartrace, in company with General Bragg and the Bishop of Georgia. We were put into a baggage car, and the General and the Bishop were the o­nly persons provided with seats. Although the distance from Shelbyville to Wartrace is o­nly eight miles, we were o­ne hour and ten minutes in effecting the trajet, in such a miserable and dangerous state were the rails. o­n arriving at Wartrace we were entertained by Major General Cleburne. This officer gave me his history. He is the son of a doctor at or near Ballincolig. At the age of seventeen he ran away from home, and enlisted in her Majesty's 41st regiment of foot, in which he served three years as private and corporal. He then bought his discharge, and emigrated to Arkansas, where he studied law, and, eschewing politics, he got a good practice as a lawyer. 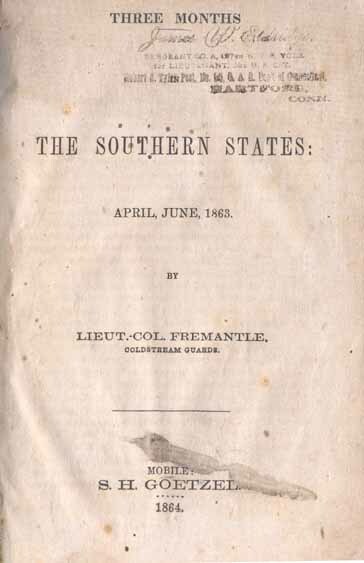 At the outbreak of the war he was elected captain of his company, then colonel of his regiment, and has since, by his distinguished services in all the Western campaigns, been appointed to the command of a division (10,000. men)--the Page 79 highest military rank which has been attained by a foreigner in the Confederate service. He told me that he ascribed his advancement mainly to the useful lessons which he had learnt in the ranks of the British army, and he pointed with a laugh to his general's white facings, which he said his 41st experience enabled him to keep cleaner than any other Confederate general. He is now thirty-five years of age; but, his hair having turned gray, he looks older. Generals Bragg and Hardee both spoke to me of him in terms of the highest praise, and said that he had risen entirely by his own personal merit. At 5 P. M. I was present at a great open air preaching at General Wood's camp. Bishop Elliott preached most admirably to a congregation composed of nearly three thousand soldiers, who listened to him with the most profound attention. Generals Bragg. Polk, Hardee, Withers, Cleburne, and endless brigadiers, were also present. It is impossible to exaggerate the respect paid by all ranks of this army to Bishop Elliott; and although most of the officers are Episcopalians, the majority of the soldiers are Methodists, Baptists, &c. Bishop Elliott afterwards explained to me that the reason most of the people had become dissenters was because there had been no bishops in America during the "British dominion;" and all the clergy having been appointed from England, had almost without exception stuck by the King in the Revolution, and had had their livings forfeited. I dined and slept at General Hardee's, but spent the evening at Mrs. ----'s, where I heard renewed philippics directed by the ladies against the Yankees. I find that it is a great mistake to suppose that the press is gagged in the South, as I constantly see the most violent attacks upon the President--upon the different generals and their measures. To-day I heard the officers complaining bitterly of the "Chattanooga Rebel," for publishing an account of Breckinridge's departure from this army to reinforce Johnston in Mississippi, and thus giving early intelligence to the enemy. Fremantle, Three Months, pp. 78-79.